The Samsung Galaxy Ace Plus has grown in both height and width to accommodate a bigger 3.65" touchscreen. The difference in size from the original Ace is negligible though, meaning the increased screen real estate mostly comes at the expense of the bezel. At 114.5 x 62.5 x 11.2 mm the Galaxy Ace Plus won't make a bulge in your pocket and allows easy single-hand operation. The 115 g of weight are on the light side, but it's an all plastic handset after all. The Galaxy Ace Plus isn't vastly different from the original, meaning it will have to stave off unflattering comparisons to the iPhone. Loyal Samsung users will probably liken it to the Galaxy S. Anyway, it's pretty much standard touchscreen bar design with rounded edges and a single hardware button up front. The front of the device is mostly touchscreen, 3.65 inches of it to be precise, and HVGA (320 x 480) resolution. The screen quality of the Galaxy Ace Plus is somewhat disappointing. The display is bright enough with good sensitivity but that's where the flattery ends. Viewing angles aren't the best around, contrast is passable when the screen is viewed head on, but quickly lost at even the slightest tilt. Having a slightly bigger screen, the Galaxy Ace Plus has lower pixel density (~158) than the original, and bits of the UI do look grainy. It's a pretty clean front design: there's an earpiece above the display and at the bottom you'll find the home button with two capacitive Menu and Back keys on each side, which only light up when used. There's also a proximity sensor next to the earpiece to automatically turn off the display during a call. The glossy back features the 5 megapixel camera lens, paired with a single LED flash and a loudspeaker grille. We did like the textured back panel of the original Galaxy Ace. The sequel has switched to glossy black plastic, which is the usual smudge magnet. There're no alternative color versions announced at this point. The right side of the handset features the power/lock button, in usual Samsung fashion. Some people may be used to having the sleep button up top, but the typical target should be brand-loyal upgraders. The left side has the volume rocker and a lanyard eyelet. The top of the Galaxy Ace Plus is where the 3.5 mm headphones jack is placed. At the bottom there's a microphone pinhole and a microUSB port for both charging and computer connections. The phone is powered by a 1300 mAh Li-Ion battery. A thorough battery test will have to wait till a full review. We'd just note at this point that the original Galaxy Ace has a 1350 mAh unit. 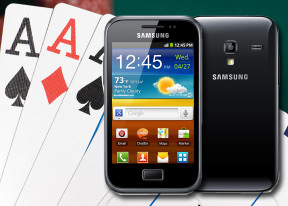 The Samsung Galaxy Ace Plus has a traditional Samsung styling and reasonably solid build. it handles comfortably and we like the fact that it hasn't grown much in size despite having a bigger screen than the original. On the other hand, the bigger display is a questionable upgrade - it stretches the resolution without giving you much in return. Overall though, it's a decent experience for an LCD screen. One thing we're not impressed with at all is the glossy finish of the rear.